The diffraction limit defined by Abbe (1873) corresponds to the radius of the spot where the light is diffracted. 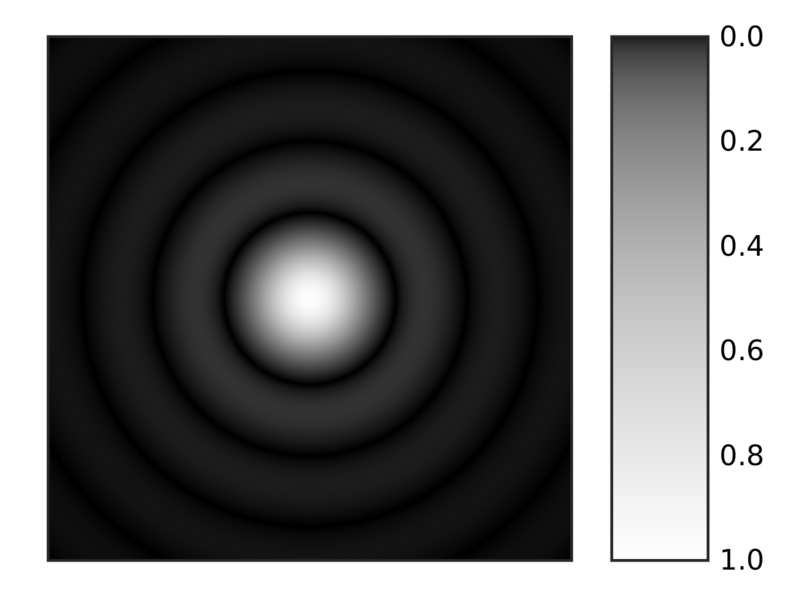 The Abbe diffraction limit depends on the light wavelength (λ), the refractive index of the medium (n) and the half-angle of the converging spot (ϴ). One limiting parameter is the numerical aperture (NA) and nowadays best optics reach about 1.4 NA leading to an Abbe limit of λ/2NA i.e. 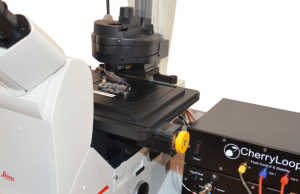 0.25µm (for green light at 500nm) (200nm laterally/ 500nm axially). 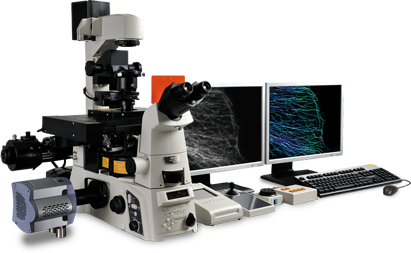 This is much higher than the resolution needed to observe and discriminate between different single molecules or compounds inside a cell. 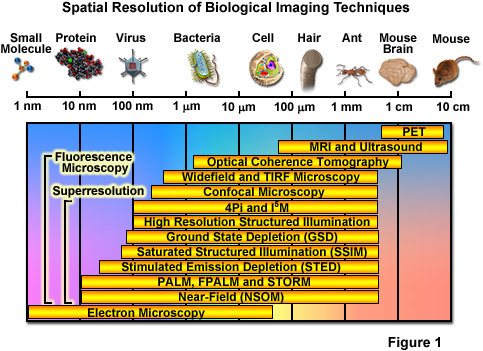 Super-resolution microscopy (SRM) allows scientists to pass the diffraction limit of light, giving them the chance to observe cellular structures at the nanometer scale , from entire organelles to individual proteins. 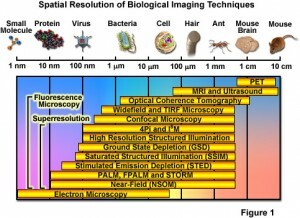 The super resolution microscopy techniques can be mainly classified in two groups that differ in lateral/axial resolution and in their inherent maximal temporal resolution. 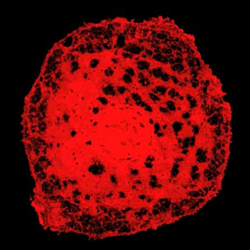 First are the patterned light illumination techniques such as Stimulated Emission Depletion (STED) and Structured Illumination Microscopy (SIM). Second are localization-based techniques which includes Stochastic Optical Reconstruction Microscopy (STORM) and Photo-activation Localization Microscopy (PALM). 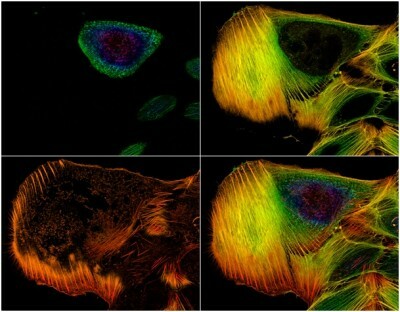 The Stimulated Emission Depletion (STED) microscopy technique’s principle is to generate super resolution microscopy images by selectively deactivate fluorophores which minimizes the area of illumination and enhances the obtainable resolution. 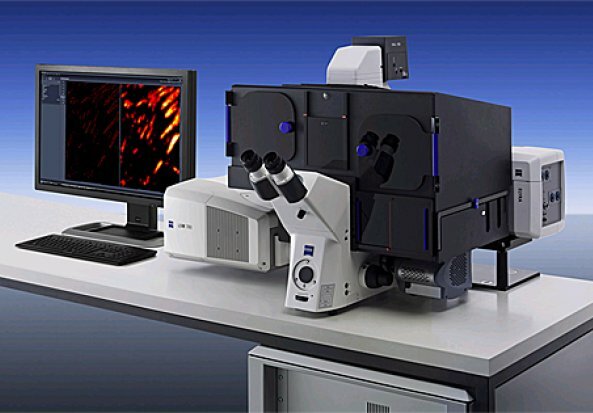 The Stochastic Optical Reconstruction microscopy or STORM is a super resolution microscopy technique that uses sequential activation and time resolved location of fluorophores that are photo-switchables to obtain images with higher resolution. 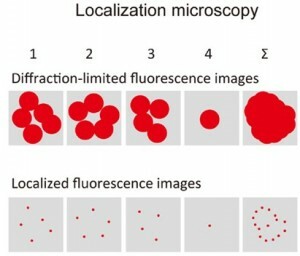 Figure 4: Scheme of the principle behind the STORM, the location-based super-resolution microscopy technique [4,5]. 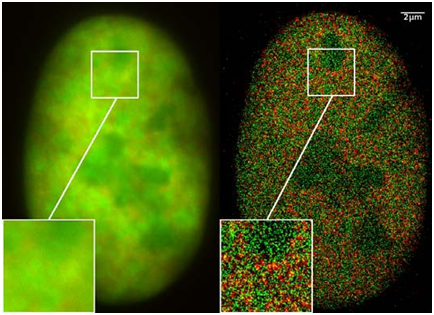 Even if the PALM and STORM techniques are very similar, the PALM one uses fluorescent proteins that are optically highlighted to stochastically switch on a sub-population of molecules to obtain a sequential single-molecule readout [6,7]. Figure 5: Scheme of the PALM technique .